The death of a respected elder while in jail has prompted an outpouring of grief and anger on the streets of Asmara. 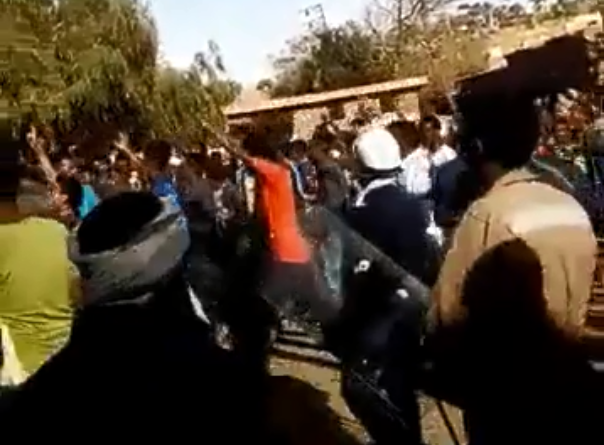 Screenshot from a video of the recent protest in Asmara, Eritrea. Last week, the respected elder Hajji Musa Mohammednur inspired aggrieved crowds in Eritrea‘s capital and shook the confidence of the regime. This was the second, and last, time he will have done so in the past few months. This first occasion was when the well-known Eritrean figure was arrested last October. The 93-year-old had recently criticised a government decree to nationalise Al Diaa Islamic School, whose board he chaired. His detention was one of the triggers that prompted hundreds to take to Asmara’s streets in an uncommon show of defiance a few days later, leading to a brutal crackdown. Speaking to parents and teachers before his arrest, Mohammednur had said he was prepared to sacrifice his life in resisting the state’s plan. The second time he stirred people to mobilise was last week when he did just that. Mohammednur’s condition deteriorated during the months of his incarceration. In December, his poor health reportedly prompted the office of President Isaias Afwerki to instruct that he be released and put under house arrest. The nonagenarian refused to leave prison unless those arrested along with him were also let out. “You can carry my dead body out of here, but I am not leaving alone,” he is reported to have said. He died a few months later. When family members went to collect Mohammednur’s body and bring it to the mosque for prayer, witnesses say they were joined by thousands more who wanted to pay their respects. On 3 March, the community leader’s funeral was held. The procession quickly escalated into an angry demonstration. Sources say some people threw stones at the police, who opened fire in an attempt to disperse the crowds as defiant youth carried the coffin through the streets. There have not been reports of casualties, but residents of the capital claim warning shots could be heard until late in the evening. Witnesses say Asmara has been tense in the days since. In one of the world’s most repressive countries, they claim that fully-equipped anti-mob police have been deployed and that there have been several arrests. An opposition news-site suggests close to a thousand people have been rounded up. Sources within the police forces say stations are on emergency alert. Mohammednur was a widely-recognised individual in Eritrea. He was a key figure in organising the 1960s pro-independence student demonstrations in which Afwerki participated, and he was once arrested for his active role in Eritrea’s armed struggle. His younger brother, Taha Mohammednur, was a co-founder of the Eritrea Liberation Front (ELF), the rebel group that started the war of independence. The current ruling party, the People’s Front for Democracy and Justice (PFDJ), originated as a splinter of the ELF. Taha also died in custody, in 2008. He had served in several senior government posts after Eritrea’s liberation before he was arrested in 2005 alongside several other prominent figures on unspecified charges. The outpouring of grief and anger following Mohammednur’s death last week can partly be explained by his influence and reputation. The elder’s decades-long service and dedication to his community and country earned him a deep respect. It was for this that he was made president of Al Diaa Islamic School despite his advanced years. Sometimes when prominent individuals have been arbitrarily arrested in Eritrea, they have been quietly dismissed as possible accomplices or quickly forgotten by the wider community. But this was not the case with Mohammednur. After his detention, sheikhs at Al Khulafa Al Rashiudin, Asmara’s biggest mosque, reportedly took the bold step of using their Friday sermons to urge adherents to stand by him. Sources say that since the protest in October, most of the capital’s mosques have been subjected to tight security. It is even believed President Afwerki himself followed Mohammednur’s case closely and was personally behind the order of the prisoner’s release in December. Security forces also seemed well aware of the possible flare up the elder’s death might cause. They allegedly delayed the release of his body for a day in order to avoid it coinciding with Friday prayers, when which large numbers of people gather. However, that did not stop mourners mobilising a day later for Mohammednur’s funeral. That large demonstration of popular frustration was one more sign that the government’s faith in the power of the gun to maintain control and keep the population silent is increasingly being challenged today. The police on the streets of Asmara are said to be nervous. The same may well be true of officials in the President’s Office following another public expression of dissent in a country where the price of expressing dissent is high. In Eritrea, the free press has been stifled and thousands of political prisoners languish in appalling conditions. On the one hand, Afwerki’s government may be quietly relieved by the passing of Mohammednur despite the disturbances it inspired. His death means authorities longer have to deal with a man who commanded wide respect, whose age-old credentials as an Eritrean patriot were tough to question, and whose recent open defiance was causing it trouble. However, on the other hand, the incarceration, maltreatment and ultimate death of the admired nonagenarian at the hands of the regime may mark another step in its slow unravelling. In the eyes of some of Eritrea’s citizens, Mohammednur’s sad demise may only further confirm the government’s moral bankruptcy as they grow increasingly tired of, and increasingly bold in their resistance to, Afwerki’s almost 27-year rule. Abraham T. Zere is executive director of PEN Eritrea. He lives in exile. His articles have appeared in The Guardian, The Independent, Al-Jazeera English, Index on Censorship magazine, among others. Follow him on Twitter at @abraham_zere. You are so far removed from reality. You can pretend but the truth never bends… but yet again prentenders like you have to beg for few western coins. People like “Rezen” were born in Eritrea,mostly either doubting or not knowing who is their father. Their mothers used to intertain several customers in Aba Shawl or similar places, one of whom is possibly the father. That is the background of a rootless who sometimes calls himself “Teklay”. Unfortunately, some of these people are now ruling Eritrea, that is why they defend a criminal regime. They have never seen the true Eritrea, outside “EndaSwa” and cities. They have never attended a Baito in rural Eritrea, to see how law and order are embedded in our culture. That is why the regime of “Deki Khomaro” is against traditional Eritrea. It has done everything to create an identityless Eritrea, devoid of it’s cherished “Higgi Endabba”. A proud Nation that solves it’s problems under the shade of a big tree. The elderly fathers are treated with great honor and respect. Their wisdom is the most valuable source of learning for the young. The Eritrea of my great fathers will prevail. May Allah/God accept in His heaven our father Haji Musa and grant His Holiness Abune Antonios heath and long life. May Allah/God help us inherit their wisdom.